Images, photography, and content are copyright protected. Please do not use the visual content without our prior permission. Place 2 or 3 teaspoons of Green Tea or Black Tea into a teapot, and add boiling water or as it is recommended in steeping instructions. Allow the tea to steep for 3 minutes. Add a small handful of Organic Spearmint and let stand for 1 minute. Add sugar (about 1 tbs per serving), and serve very hot in small glasses. Ingredients: 1 Ripe Organic Banana, 1 teaspoon of Organic Spearmint or Peppermint Leaves, Grated Peel of 1 Lime, a cup of organic skim milk, 5 ice cubes. Place the banana in a blender and puree until smooth. Add the remaining ingredients and blend until slushy. Serve immediately. 2 parts any Jasmine tea, 1/4 part Freeze Dried Pears. Thoroughly blend all ingredients in a drum or large bowl and place in jars or tins. Adjust ingredients for larger quantities. 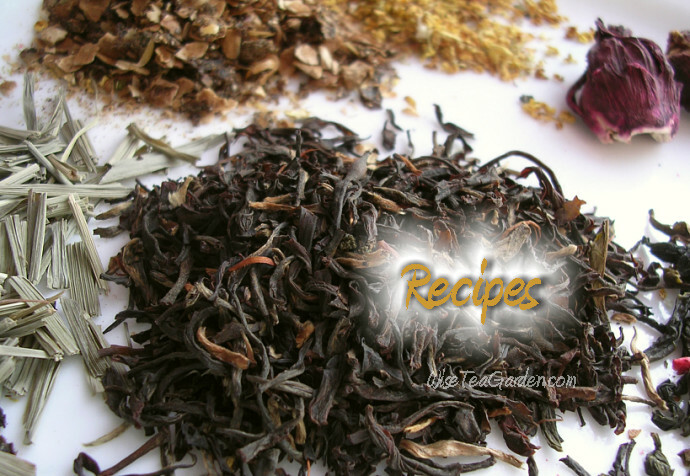 1/4 lb Organic Ceylon Tea (We would recommend Lover's Leap), 4 tbs Dried Orange Pieces or Orange Peel, 1 tbs ground Mekong Cinnamon (include a few larger pieces of cinnamon in the blend for visual effect.) Thoroughly blend all ingredients in a drum or large bowl and place in jars or tins. Adjust ingredients for larger quantities. 1 part Dried Organic Lemongrass, 1/2 part dried Jasmine Buds. Thoroughly blend all ingredients in a drum or large bowl and place in jars or tins. Adjust ingredients for larger quantities. An exotically sweet herbal infusion can be made by brewing Dried Jasmine Buds in the same way you would a cup of regular tea. The cup calms the mind and cools the body. Use roughly 1 level tablespoon per cup, infuse for 3-5 minutes, strain and enjoy. Also makes an interesting and delicious iced tea - simply strain hot tea over a tall glass of ice. In a medium saucepan, mix 1 cup of the cream with the milk, sugar, and a pinch of salt. Warm the cream mixture over medium-high heat, stirring occasionally, until the sugar dissolves and tiny bubbles begin to form around the edge of the pan, 3 to 4 minutes. Stir in the tea leaves and orange zest. Cover, remove from the heat, and let sit for 1 hour. Taste and let sit longer if you want a stronger flavor. Prepare an ice bath by filling a large bowl with several inches of ice water. Set a smaller metal bowl (one that holds at least 1-1/2 quarts) in the ice water. Pour the remaining cup of cream into the inner bowl (this helps the custard cool quicker when you pour it in later). Set a fine strainer on top. Whisk the egg yolks in a medium bowl. Rewarm the cream mixture over medium-high heat until tiny bubbles begin to form around the edge of the pan, 1 to 2 minutes. In a steady stream, pour half of the warm cream mixture into the egg yolks, whisking constantly to prevent the eggs from curdling. Pour the egg mixture back into the saucepan and cook over low heat, stirring constantly and scraping the bottom with a heatproof rubber spatula until the custard thickens slightly (it should be thick enough to coat the spatula and hold a line drawn through it with a finger), 4 to 8 minutes. An instant-read thermometer should read 175F to 180F at this point. Don't let the sauce overheat or boil, or it will curdle. Immediately strain the custard into the cold cream in the ice bath. Press firmly on the tea leaves and orange zest in the strainer with the spatula to extract as much flavor as possible. Cool the custard to below 70F by stirring it over the ice bath. Refrigerate the custard until completely chilled, at least 4 hours. Then freeze the custard in your ice cream maker according to the manufacturer's instructions. Transfer the just-churned ice cream to an air-tight container, and freeze for at least 4 hours or up to 2 weeks. Combine hot tea, currants and sugar and leave to soak until tea is cold, or overnight. Prepare a regular sized loaf tin by spraying with oil and lining bottom with baking paper. Preheat the oven to 180C. Mix flour and egg into tea mixture. Pour into tin and bake for around an hour. Cool on rack. Ingredients: • 2 cups organic all-purpose flour • 2 tablespoons loose Organic Earl Grey Black Tea leaves • 1/2 teaspoon salt • 3/ 4 cup confectioners' sugar • 1 teaspoon organic vanilla extract • 1 cup (2 sticks) butter, room temperature. In a food processor, pulse together the flour, tea, and salt, until the tea is just spotted throughout the flour. Add the confectioners' sugar, vanilla, and butter. Pulse together just until a dough is formed. Place dough on a sheet of plastic wrap, and roll into a log, about 2-1/2 inches in diameter. Tightly twist each end of wrap, and chill in refrigerator for 30 minutes. Preheat oven to 375F. Slice the log into 1/3-inch thick disks. Place on parchment or silpat lined baking sheets, 2 inches apart (2 probably needed depending on size of sheets). Bake until the edges are just brown, about 12 minutes. Let cool on sheets for 5 minutes, then transfer to wire racks and cool to room temperature. Ingredients: 140g organic all-purpose flour (250ml), 37.5ml icing sugar, 1ml salt, 2 organic eggs, 250ml organic milk, 15ml brandy. Sift dry ingredients together. Beat eggs, add milk and stir into dry ingredients. Add brandy. Leave for approximately 30 minutes. Cook pancakes in a small pan and serve hot with Rooibos sauce. Ingredients: 75ml strong Organic Rooibos, 100g organic cane sugar (125ml), 50ml brandy, organic lemon juice and grated rind of 1 organic lemon, organic orange juice and grated rind of 1 organic orange. Combine all ingredients, stir until sugar has dissolved and leave for at least 30 minutes. Serve with hot crêpes. Ingredients: 3.5 litres orange Organic Rooibos (for soaking process), 500g sugar beans, 150g bacon diced, 1 large onion, chopped 5 beef stock cubes dissolved in 1 litre hot Rooibos, 2 medium potatoes, grated 2 ripe tomatoes, diced 2 large carrots, grated salt, coarsely ground black pepper. Wash beans and soak overnight in Organic Rooibos. In a large saucepan, bring beans and soaked Rooibos to the boil, reduce heat and simmer until cooked. Sauté bacon and onions for a few minutes. Add with all the remaining ingredients to the beans. Simmer for 30 minutes. Serve with whole wheat bread.